Hi, I'm composer Greg Weaver! I was born on July 27, 1987, in the wondrous land of Virginia Beach, VA. Composing for video games hasn’t always been my dream. When I was a child I wanted to be a saxophone-playing scientific baseball player. After bending to the facts that I enjoyed writing more than ‘rithmetic and playing video games more than expressing my lack of athleticism, I had only one avenue left to take. With saxophone in hand, I set off horseless into the horizon. My musical influences through grade school were pretty varied. When I was in elementary school, I really enjoyed listening to my dad’s old albums, mostly those of The Talking Heads, The Cars, The Rolling Stones, and The Monkees. Otherwise, I had an affinity for Phil Collins and Genesis, The Eurythmics, Disney, and the soundtrack to West Side Story. These tastes carried well into middle school, and added to them were They Might Be Giants and “Weird Al” Yankovic courtesy of my brother. It was during this span of time that I started to love playing video games. My first system was an Atari 2600, and my grandparents eventually harbored what I believe to be my cousin’s old Nintendo at their house. Often my brother and I rented Super Nintendos from Blockbuster (what an awesome service!) until our parents thought it was probably more cost-effective just to buy us one. Needless to say, I was transfixed by a lot of this music, too. When I played Tetris on my Game Boy in the car I would sing along and improvise lyrics while doing so, thusly annoying my brother and sister to no end. Mega Man also was huge for me in both console and handheld form, but my greatest awakening came about via the Squaresoft SNES classics, namely Chrono Trigger, Final Fantasy III (VI), and Secret of Mana. Then, when I thought nothing could be better, Final Fantasy VII’s soundtrack penetrated my aural cavities. Coupled with its stunning visuals, I was hooked and set down the path of a becoming Playstation and Square loyalist, where I more-or-less remain to this day. Aside from the game music, my late-middle school and high school years would take me into other, uncharted territory. In 8th grade, as I was picking up my brother’s punk albums—mostly those by MxPx and Less Than Jake—, I started playing Dance Dance Revolution. Needless to say, those styles were pretty in contrast with each other, and, in the days of the dawn of Napster and Kazaa, I was constantly eating it up. In the end, though, all of that music would become enjoyed mostly for nostalgic purpose while I started to delve into what truly inspires me: jazz. Though I had played alto, bari, and soprano sax in the jazz band at my middle school, Kemps Landing Magnet, my first real encounter with jazz music was in high school. I enrolled in the Governor’s School for the Arts, a half-day-everyday arts program based out of Norfolk, VA, where, through my teachers Liz Barnes and Jeff Smith, I was turned on to the likes of Charlie Parker, Thelonious Monk, and Joe Henderson through both listening to and playing their music. Through my years there, I started to be inspired by those such as Michael Brecker, Chick Corea, Eric Alexander, and, most importantly, Chris Potter and Dave Holland. 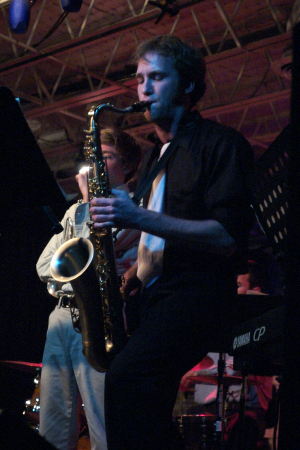 It was in my senior year that I first picked up my current main instrument, the tenor saxophone. My love for the music just kept growing. I went to college at the University of Virginia with practical aspirations—to find something I love doing besides music—but that was to no avail. I thought I would major in Japanese, but in the end I got a B.A. in Music with a minor in East Asian Studies. While there I studied under saxophonist Jeff Decker and trumpeter John D’earth, as well as bassist Pete Spaar, drummer Robert Jospe, and guitarist Mike Rosensky, and started to write my own music. I also started dabbling in Computer Music and was devouring as much Beethoven, Bach, Stravinsky, and Shubert as I could. Along with a “classical” music revelation, I had a popular music revitalization. Right before I graduated high school, I bought every Stevie Wonder album from 1969-1980 and constantly listened to them (and still do!). From then until my second year at UVA, I don’t recall picking up any other popular music albums, but then, I realized that certain popular artists were influencing my favorite jazz artists. That’s when I raided the library for every Bjork, Radiohead, and Joni Mitchell album I could find. With those albums and a campaign to supplement my dad’s Talking Heads collection with all of their other ones, I was set for the rest of time at UVA. In my final year, I had a senior recital. My group for the show, the Gregory Weaver Jazz Congregation, consisted of those persons with whom I had played since first year. I called my show “Timeline” because I wanted to focus on all of the types of music that I had listened to growing up that lead me to this point. “Timeline” featured my first popular song jazz arrangements, including tunes from No Doubt and the big three that I had previously noted, Bjork, Radiohead, and Joni Mitchell. It also included an arrangement of Proto Man and Gemini Man’s themes from the Mega Man series. It wasn't until after graduation that I seriously started to consider composing for games. When friend and game programmer Nick Parisi invited me to compose for a game he was making for his portfolio, Ice Breakers, I happily obliged and started to think that composing was something that could be in my future. Since then, I have composed for other small projects by friends and for SRRN Games/Penny Arcade's interactive storybook app, "The Hawk and the Hare." In October 2011, I created [Score. ], which was originally just a VGM composition/review blog. In its most basic sense, the blog served as a way for me to connect to VGM fans by sharing my work with them and by reviewing game music soundtracks. I aimed to write my posts in a way that is both accessible to the everyday reader and interesting technically to fellow musicians and composers, which is similar to how I approach writing my original works. Until February 2013, I worked as the Operations Manager for the Virginia International Tattoo at the Virginia Arts Festival in Norfolk, VA. But, it was in February that I decided to leave my job to move to Arlington, VA, taking a few months off of having a fulltime job to work solely and seriously on bolstering my musical skills and my composition portfolio. After having come a long way during my sabbatical, I have officially founded my music company, [Score.] Musicworks, and now am off to the races, actively looking to enhance developers' games through thoughtful, engaging music composition. You can read more about my company's goals on the Mission page. Thanks for reading! Let's look forward to a bright future for video game music!